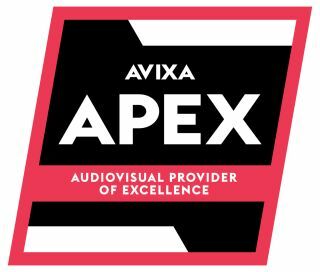 Electrosonic EMEA is pleased to announce that it has qualified as an AVIXA AV Provider of Excellence (APEx). AVIXA APEx is a marketing recognition program for integration companies and AV design consulting firms dedicated to upholding industry excellence by providing quality service to customers. The rigorous APEx program recognises companies based on the number of employees holding key industry qualifications, and a positive response to an independent customer survey. Fifteen percentof total employees must have attained AVIXA’s CTS certifications including the CTS for general expertise in AV, the CTS-D for specialisation in AV design and the CTS-I for specialisation in AV installation. APEx providers must also prove that they meet or exceed the requirements within two ANSI/INFOCOMM standards, the Standard Guide for Audiovisual Systems Design and Coordination Processes and the AV System Performance Verification Standard,to foster better communication between the AV provider and the client. Electrosonic is committed to the continual development and education of its staff worldwide. Employing a diverse team of talent with different backgrounds, cultures, ages and experiences, allows them to design, build and support innovative technology solutions all over the world. Electrosonic is an international audiovisual and technology services company that designs, builds, and supports innovative solutions creating lasting experiences where people live, work and play. Founded in 1964, Electrosonic has been recognizedfor its superior and unsurpassed technology master planning and system integration. With unique global capability, we deliver highly complex world-class projects, conference room technology, and executive briefing centresacross a multitude of sectors including financial services, professional business, entertainment - theme parks, museums and visitor centres, gaming and hospitality, technology and media, energy and utilities. Electrosonic provides a comprehensive scope of technical and professional services with expertise in ICT and Network Infrastructure, Security, Surveillance and Access Control, Audio, Video and Control Systems, Acoustics. Electrosonic is where imagination comes to life.